I can’t help but smile everytime I remember the scene I had with my daughter the other day. She was upset as she stared at herself in the mirror. She said something to me which goes like, if growing up means having zits all over my face, then I don’t want to grow up ever. You see, she inherited my husband and I’s oily skin type and she is starting to have breakouts. I wasn’t blessed with a flawless skin. I had to deal with acne while growing up. I knew that consulting a dermatologist costs a fortune and my skin is understandably not in my family’s list top priorities so I dealt with the pesky pimples on my own. I tried different skin products but the thing is, their effects didn’t last that long, so I kept on changing skin products. When I gave birth to my daughter, my hormones began to regularized and the acne was completely gone, or so I thought. Two years ago, I had a bad case of adult acne again. My friend who is a dermatologist recommended Proactiv Solutions to me. They weren’t available here yet at that time or I just wasn’t aware where I can purchase them so I asked my cousin from the States to send me some. It’s combination therapy system worked well for me that now, I absolutely swears by the product. I like how fast acting it is. This is mainly due to the presence of micro-crystal benzoyl peroxide in it that gently exfoliates and removes dirt, excess oil and dead skin cells. It has natural botanicals that proactively clean the face from all impurities and excess oil. After use, it leaves my face feeling soft, fresh and clean. Plus, it has a money back guarantee which is not available in other skin care products. I am happy to share that Proactiv Solutions is now readily available in the market today and that you can actually purchase your 30 Day Kit or 60 Day Kit online by logging on to the Proactiv Online Shopping Cart. And what’s more they currently have an Upgrade Promo which is exclusive to Philippine residents only. 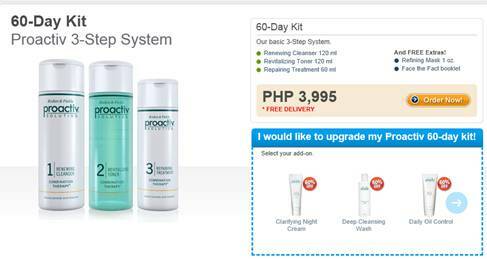 If you purchase a Proactiv 30-Day Kit, you will be entitled to upgrade your kit with 1 Proactiv Extension item at 50% discount. And a purchase of a Proactiv 60-Day Kit entitles you to an upgrade of 1 Proactiv Extension item at 60% discount. 2. 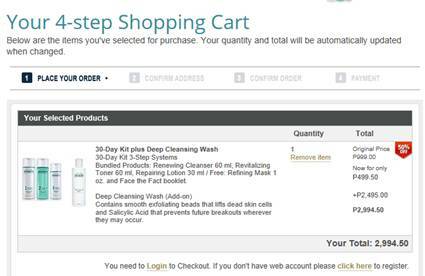 Register and create an account with Proactiv to be able to transact and purchase your own 30-Day or 60-Day Kit. When purchasing, you can pay via credit card or COD. All purchases of upgraded kits are delivered without any delivery charges. 3. 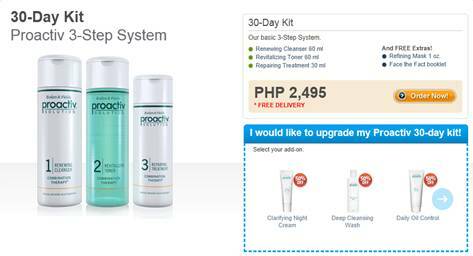 Buy either a Proactiv 30-Day Kit or Proactiv 60-Day Kit to avail of the discount for any Proactiv Extension Product. You may choose to select an add-on to your Proactiv Kit at a big discount. Menu can be found on the lower right side of the screen. 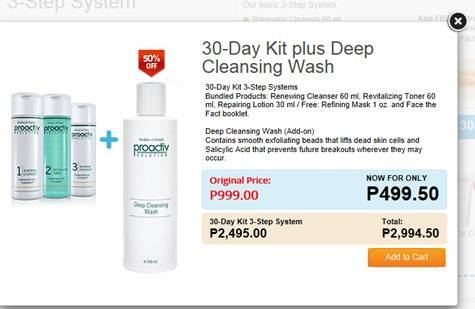 Note: You can only avail of the given discount for one (1) Proactiv product (1 Proactiv Kit=1 Proactiv Product). 4. After you have clicked your preferred add-on upgrade, a pop-upscreen will appear which will show the discounted price of the add-on, and the total package price of your upgraded purchase. 5. You now have the option to add this to your cart, and finish your order. I know,most of female’s are conscious about their skin.But they aren’t aware about the cause of it.A good sleep with regular timing can wash-away most of your problems.Lack / Irregular Sleeping habit can cause hormonal imbalance. Acne’s can really be a big headache. Good thing there are products like proactive that can help yeah in the battle against acne. Proactive seems to have made some problematic teens and adults happy. I’ve actually seen Proactive being displayed on Watsons. This online deal is great, we can save a lot! i want to try pro activ too!! It does get costly in battling Acne and quite difficult finding the right product that would soothe your needs. Proactive is worth a try for acne problem .I have seen a lot of endorser and blog post on how effective the product is .my teenage so, want me to order online for him but the problem is he don’t have acne yet. looks expensive but some are saying that it is worth it.. waaa.. I really do not use this stuff or any other similar ones..
good thing you finally found the product that suits your skin. anyway beauty really comes with the price. I have been hearing about Proactive before but I don’t have any idea if it really works well. Great review. I wonder if they really work. Nice. Been in this situation before way back when I was a teen. Nice to learn that there are now new ways and products to treat these. Keep it up! will try this on my son’s stubborn pimples! of the lotion at the risk of the skin becoming dried out, leathery and full of wrinkles. probably wonder how you ever lived without them. your product are goods but out of my pocket range. Change your routine life and do some adventure.